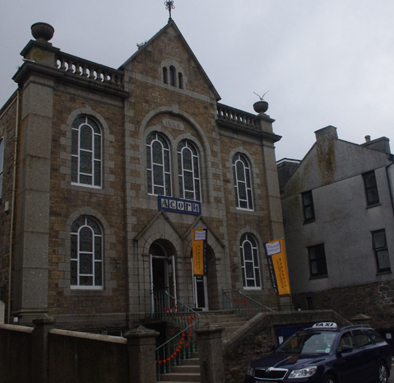 I went back into Penzance in the evening to take part in a literary quiz at The Acorn. I joined a team of four called “The Last Train” as they had to catch the 9.45 to Birmingham that evening. At half time we tied in equal first first place and won a signed book, “Gentleman Captain”, by J D Davies. But by then my four companions had to leave for the train. I then joined another team of four who were coming last as they had only got six correct questions. They were amazing people. One of the two couples (Chris and Melinda James) were originally from Texas but had been living in Penzance for five years. They claimed to be truly Cornish and had persuaded a professional artist, Jason Walker, to paint their portraits as “The Old Cornish Couple”, complete with Cornwall’s flag in the background. They claimed that the picture was hung in the Portrait Gallery in The Mall, London. That night there was a violent thunderstorm but the 1 Minute Tent survived. This entry was posted on Saturday, July 19th, 2014 at 9:59 am and is filed under Books, Travel. You can follow any responses to this entry through the RSS 2.0 feed. You can leave a response, or trackback from your own site. however this website provides quality based writing.